If a specific cleaning method is given on the label then this must be followed. Below you will find more general guidance. Always remember to wear gloves, face shield and plastic apron/appropriate waterproofs when cleaning. The cleaning of the sprayer starts already when calibrating: if calibration is done correctly, there will be very little spray solution left in the tank after spraying. The emphasis today is to encourage in-field cleaning using dedicated equipment on the sprayer. 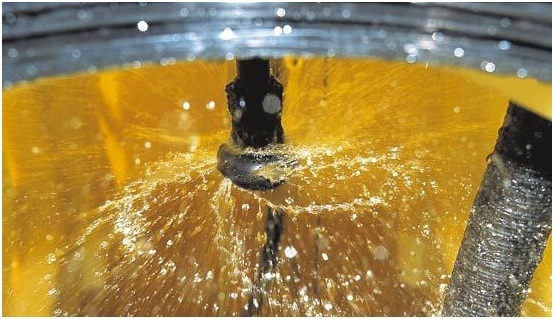 In some instances, small residual volumes of spray solution have been drained from the machine and disposed using the services of an authorised company. Dilute the remaining liquid and spray this out over an area which would comply with its approved use in a manner that avoids exceeding its maximum dose. Diluted 10 times with water and sprayed out over the just treated area or similar will often meet that requirement simply and effectively. A dedicated rinsing tank mounted on the sprayer is the first important requirement for quick and easy field cleaning. The most efficient use of the water in the rinsing tank is achieved if the water is used in 2 to 4 lots; using half, one third or one fourth of the water for each rinsing. It is important that all valves are operated whilst rinsing so that trapped spray solution is removed from everywhere in the system. If the sprayer is equipped with a rinsing nozzle this should be activated during each rinsing to achieve the most efficient cleaning of the internal spray tank. It is important that the sprayer is emptied as much as possible after each rinsing to ensure maximum dilution with each new introduction of rinsing water. The rinsing water is sprayed in an area of the crop just treated. Ensure that the maximum approved dose for that product is not exceeded. To minimize the amount of rinsing water that has to be used and then disposed, the tank is flushed internally using the equivalent of 10% of the tank size. This is repeated twice. A high pressure cleaner is a useful help. After each rinsing stage, the rinsing water is sprayed over an area of low environmentally-valued vegetation that will not be damaged near the farm but, if possible, the just treated crop or similar is preferred. Before applying the rinsing water over the crop, all valves must be activated for a complete rinse. Do remember that whichever way you dispose of plant protection products, the procedure used must comply with your local rules and regulations. In particular, be aware that no rinsing water ends up in ditches, drains or sewage. An absolute cleaning of the sprayer following one type of crop use ready for another. To be able to confidently treat crops that are very sensitive to the agrochemical that has just been used in an earlier application, it may be necessary to chemically breakdown the smallest traces of the active that are stuck to the structures of the sprayer. If a method is written on the agrochemical label - this must be followed! Cleaning without rinsing nozzle: Fill the spray tank with water and an approved cleaning agent like ammonia, or a product marketed for sprayer cleaning. Turn on the pump and let the solution circulate through the whole system for 15 minutes. Do operate all valves  on sprayers with selfcleaning filter: increase the pressure until the safety valve is activated, then reduce the pressure again. To ensure that the tubes and hoses on the boom are also cleaned remember to let the nozzles spray for a while during the process onto grassland or the just treated crop. Leave the sprayer for a couple of hours to ensure that any residues of chemicals are de-activated. This cleaning solution may be sprayed over the just treated area or grassland. Dismantle and remove all filters and nozzles and place them in a container of the same cleaning solution as used in the spray tank. After a while they are given a final clean with a brush and rinsed with clean water and fitted back on the sprayer again. Finally the whole sprayer is rinsed with clean water that is also sprayed over the just treated crop or grassland  somewhere with vegetation where it does no harm.